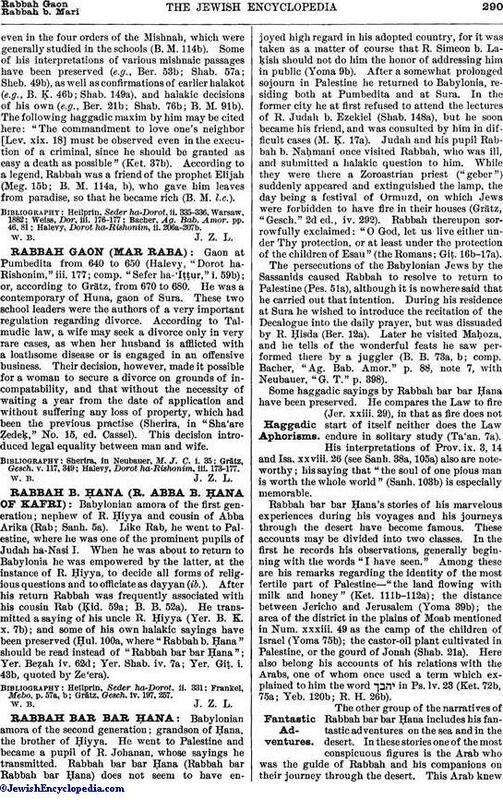 Babylonian amora of the second generation; teacher and father-in-law of R. Naḥman b. Jacob. He was related to the house of the exilarchs (Letter of Sherira Gaon, in Neubauer, "M. J. C." i. 23; Halevy, "Dorot ha-Rishonim," ii. 412), and is even said to have been an exilarch himself (Weiss, "Dor," iii. 176; Bacher, "Ag. Bab. Amor." p. 46). He lived at Nehardea; and after the destruction of that city in 259 he went with his son-in-law to Maḥoza, where they both settled (Letter of Sherira, l.c. p. 29). There are allusions to a number of decisions and rulings made by him while at the latter city (Yeb. 115b; Shab. 59b; 'Er. 26a). He was a pupil of Rab (Abba Arika), whom he frequently cited as an authority (Sanh. 63a; Shab. 129b, 130b; 'Er. 75b, 85a, 86a; Giṭ. 62b; and many other passages). Rabbah was not a prominent teacher; and he himself admitted that he was not thoroughly versedeven in the four orders of the Mishnah, which were generally studied in the schools (B. M. 114b). Some of his interpretations of various mishnaic passages have been preserved (e.g., Ber. 53b; Shab. 57a; Sheb. 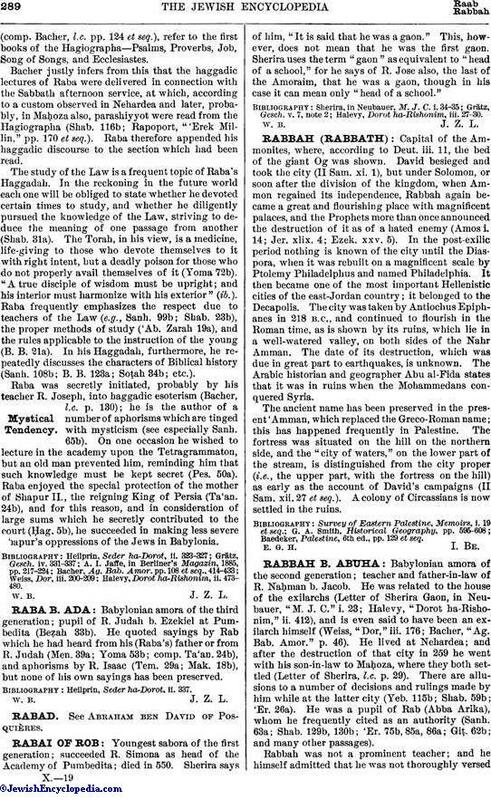 49b), as well as confirmations of earlier halakot (e.g., B. Ḳ. 46b; Shab. 149a), and halakic decisions of his own (e.g., Ber. 21b; Shab. 76b; B. M. 91b). The following haggadic maxim by him may be cited here: "The commandment to love one's neighbor [Lev. xix. 18] must be observed even in the execution of a criminal, since he should be granted as easy a death as possible" (Ket. 37b). According to a legend, Rabbah was a friend of the prophet Elijah (Meg. 15b; B. M. 114a, b), who gave him leaves from paradise, so that he became rich (B. M. l.c.). Halevy, Dorot ha-Rishonim, ii. 206a-207b.